Green babies who are beginning to toddle along need safe, eco-friendly walking shoes that will enable them to tread lightly on the earth — while also staying put on their little feet and fostering healthy foot growth. Keep your eco-ethics in check with baby shoes that promote a healthy planet — and as parents we all know that the adorable-factor when it comes to choosing tiny little shoes is all part of the fun too! 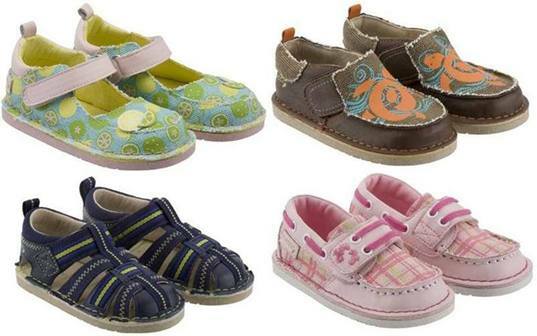 Here are five awesome shoes for little walkers that are safe, eco-friendly and look good to boot (pun intended)! Robeez 1st Stepz collection is now available in eco-friendly styles — perfect for brand new walkers (6-24 months). Like all Robeez shoes, eco-friendly 1st walkers carry a prestigious Seal of Acceptance from the American Podiatric Medical Association; a seal that’s awarded to products that promote natural foot function. The Robeez Eco Collection is made to flex and bend with every step your little one takes — and these shoes promote proper balance and unrestricted growth. Eco-qualities include organic canvas and recycled leather upper, eco-friendly, naturally tanned leather linings for breathability, 30% recycled rubber sole and water-soluble inks. 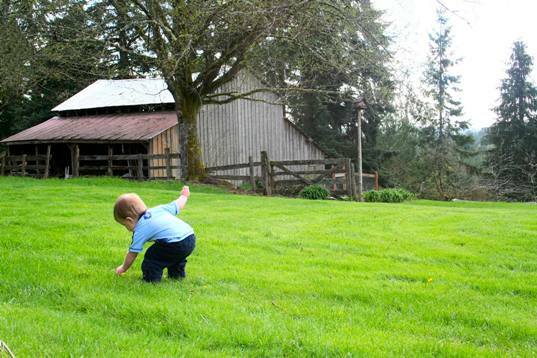 This sustainable collection includes adorable styles for girls and boys. 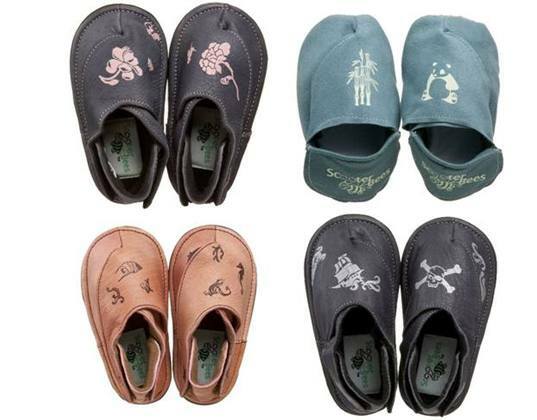 Simple shoes are adorable, earthy and their new walker Toddler Doodles are made with good stuff like washable suede from an eco-certified tannery, soft and fuzzy certified organic cotton fleece lining, recycled PET and natural latex elastic laces, and water based glue. 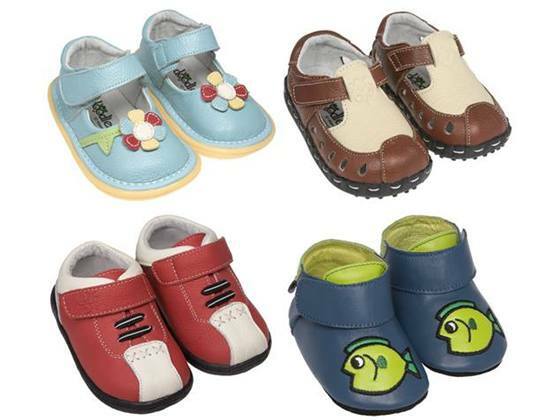 Doodle shoes are flexible (a must for new walkers) and washable (a must for parents)! Plus these shoes come with recycled foot form inserts and are smartly packaged in a shoebox made of post-consumer recycled paper, soy based printing ink, natural latex and starch based glue. It’s like adorable earth love in a box! ScooterBees shoes for tots are eco-friendly soft-soled shoes with maximum durability that allow little feet to explore their world with ease. ScooterBees contain zero lead, zero phthalates and are made with recycled fibers from both post-industrial and post-consumer sources, including PET soda and water bottles. ScooterBees’ soles are anti-slip and water-resistant, made with ThermoPlastic Elastomer (TPE) material. TPE is a degradable material made of carbon and hydrogen and no harmful chemicals are used in its production. Additionally, this material is PVC-free, latex-free, chloride-free, dioxin-free and phthalate-free. ScooterBees can be washed on a gentle cycle, and they come in 3 sizes that are perfect for new walkers (6-12) months, (12-18) months and (18-24) months. 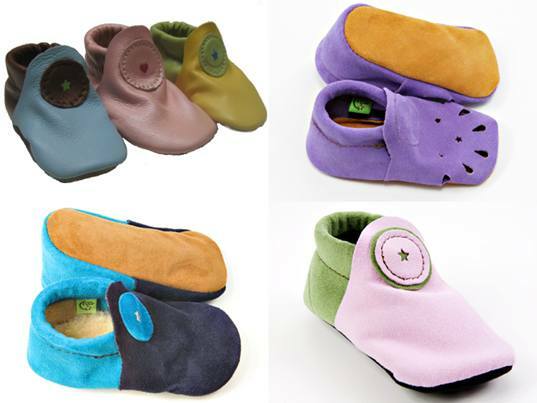 Soft Star makes soft leather baby shoes crafted with non-toxic dyes and formaldehyde-free tanning processes. Shoes are easy to put on little feet and stay put, providing the ultimate in comfort and protection for little feet new to this whole walking process. Many styles are available with fluffy sheepskin innersoles to absorb moisture, and all shoes have non-slip leather soles. Additionally, Soft Star offers many vegan-friendly shoes for the leather-banning tree hugging babies in your world. Green babies who are beginning to toddle along need safe, eco-friendly walking shoes that will enable them to tread lightly on the earth -- while also staying put on their little feet and fostering healthy foot growth. Keep your eco-ethics in check with baby shoes that promote a healthy planet -- and as parents we all know that the adorable-factor when it comes to choosing tiny little shoes is all part of the fun too! Here are five awesome shoes for little walkers that are safe, eco-friendly and look good to boot (pun intended)!